I still have snaps from summer and autumn, but I will show you the most recent one. At Clerkenwell Vintage Fair in November. Me and Yoko from Run Rabbit Run Vintage(@runrabbitrunvintage). I really look forward to seeing my buyer friends from Japan. We often meet at vintage fairs and markets. After buying we talk a lot and show what we bought. They are really successful in Japan, but I am still not. Meeting with them is a really fun and inspiring for me. She is wearing a fabulous military coat from circa 1980's. She was not sure about the big shoulder design, but I said BUY. In the end, it really suits her and everyone said her "What a lovely coat!" I have a lot of jewellery I want to upload, but I couldn't catch up....! I will do my best to show my fav jewellery as much as possible. First, "Birds bring happiness", you can already see in my online store. Bird is always popular symbol since Victorian era. The next series will be "The song of bugs in Autumn". Well, real bugs are already in the ground, but how about shiny bugs on your tops? The next series will be "The jewellery box of Snow Queen". I will show you my best shiny party jewellery. I hope you can get them before the party season! I will separate them to 2 parts, Ice Jewellery of rhinestones and Snow Jewellery of pearls. They are perfect for parties, but also daily use! The dealer she sold this to me said, it's Hagler's. But there is no signature. There are more fabulous jewellery, though I won't put them on online store! I don't have time to take photos, but if you are interested, please check my SNS. I will show them from the photos from markets. 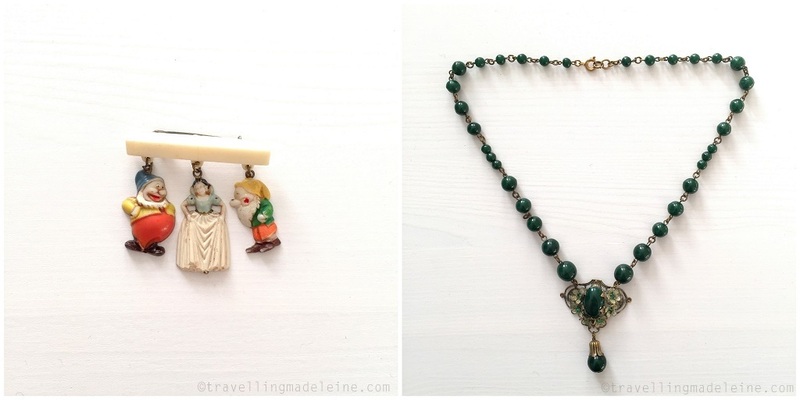 I have got lots of beautiful Art Deco necklaces and Autumn coloured jewellery. I have got cute home decor items too. 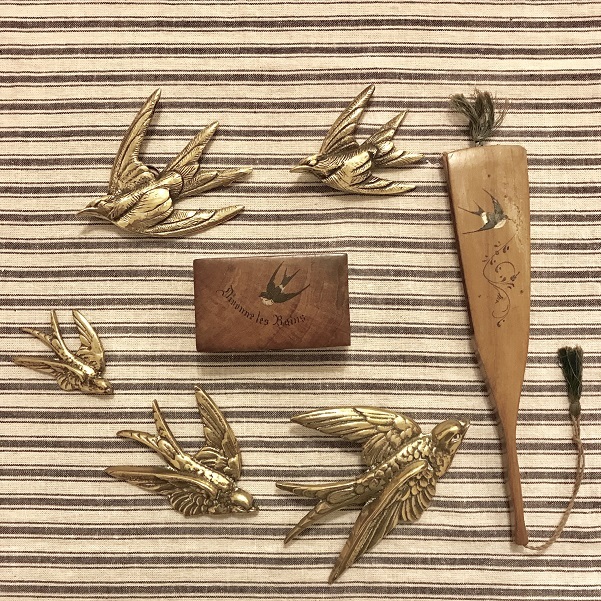 I have got lovely swallow motif items. My favourite is the fan in the right. The little box in the middle is a post stamp box. Perfect for jewellery, and of course, for stamps. 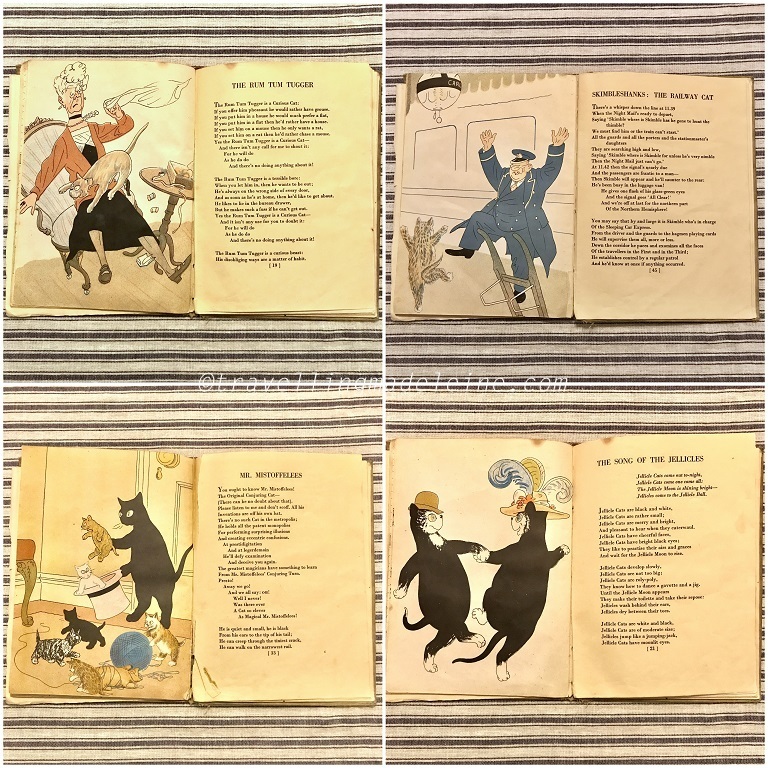 I have already shown at Old Spitalfields, but I have got a vintage book of Old Possum's book of Practical Cats" by T.S. Eliot. It was published by 1939. This book is the 6th edition, which might be from the 1940's. 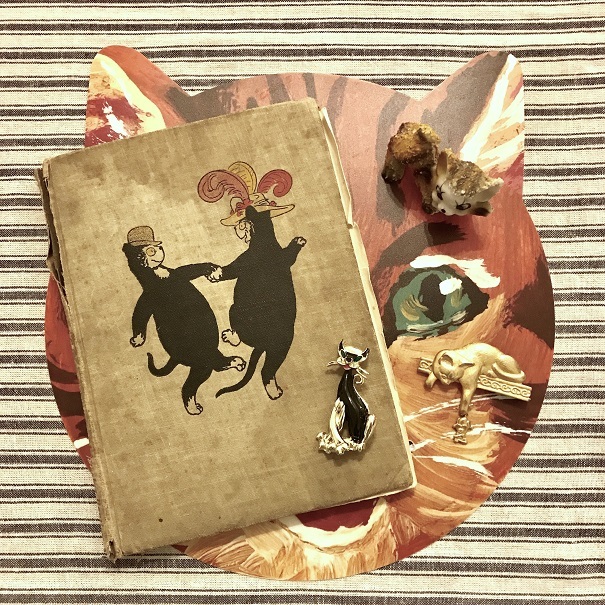 This is the original story of the musical CATS, which is in the news at themoment about the cinematizing. I didn't know there are so cute illustrations with it! I can't wait the movie too! This is German Steiff, from the 1960's. 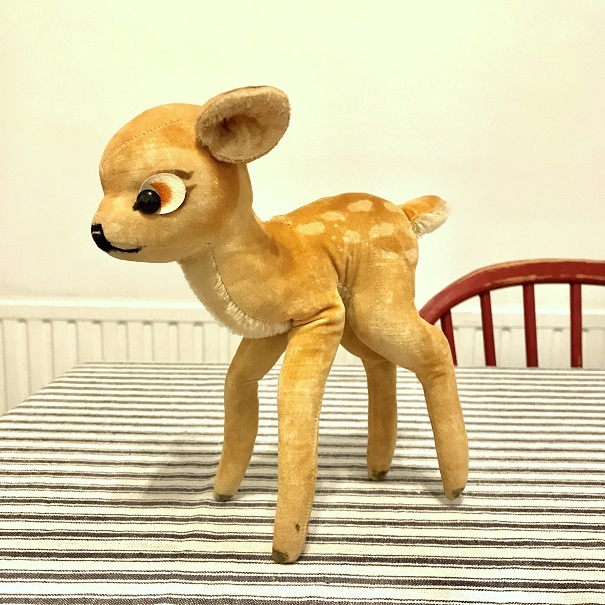 Disney's bambi. So cute and retro. I have more new items! I hope I will be at Old Spitalfields on 22nd, this Thursday. It will be confirmed tomorrow, 21st. I will confirm on SNS account. There are lots of items I will NOT upload on my web shop. If you are interested in something from the photos from markets, please contact me. It's not this month, but I will be at Frock Me! 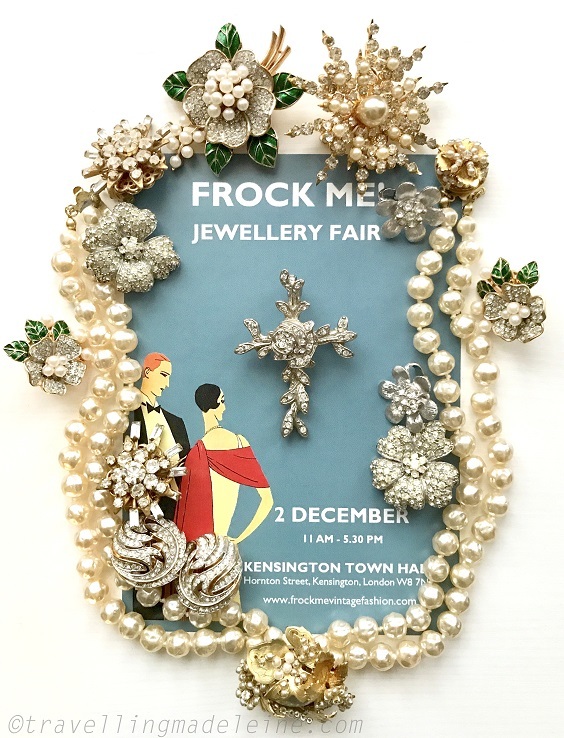 Vintage Jewellery fair on 2nd December Sunday. It is going to be at Kensington Town Hall and I will be at 1st floor. I am joining for Jewellery fair, but I will bring some clothes too. I will do Sale for clothes, so don't miss it! 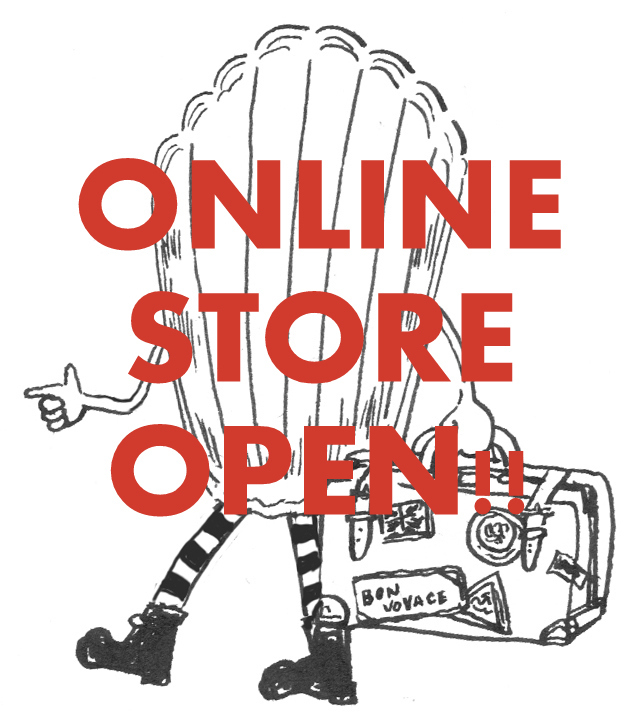 I will bring most of items from my online store, so I will close my online store on the day and before. Thank you and I hope to see you there! Hi everyone, long time.... I didn't post for almost a month....! And 2018 is finishing soon! At Wilton Music Hall Popup Vintage Fair in July. Good balance of a flare blouse and high waist trousers. Love the hair band too. Sorry to keep you waiting, the new arrivals of this month! These are the new arrivals for my online store this month! 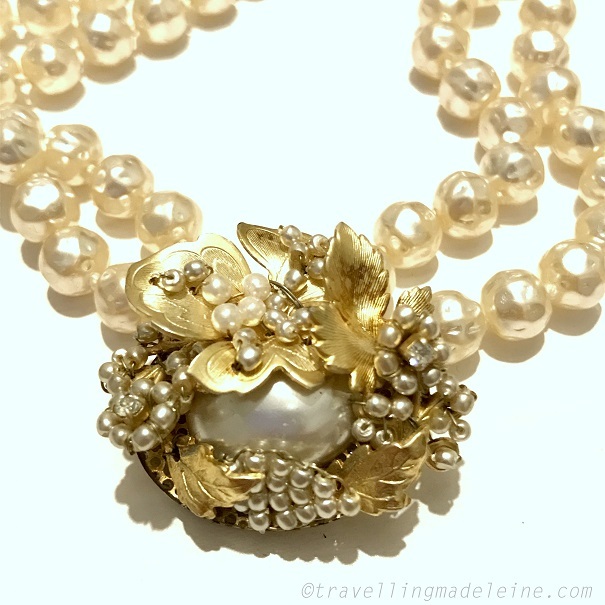 I collect jewellery inspiring Snow White story. Volume 2 is "Golden Afternoon". 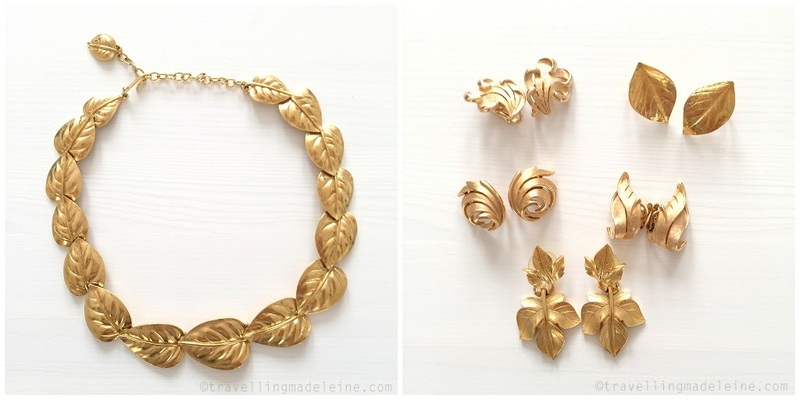 I collect gold leafy items, mainly from Trifari. Yellow autumn leaves are shinning gold with warm sunshine in afternoon. Perfect for this season, but golden leaves are useful items for all seasons. I have got a big chunky Trifari leaf necklace. 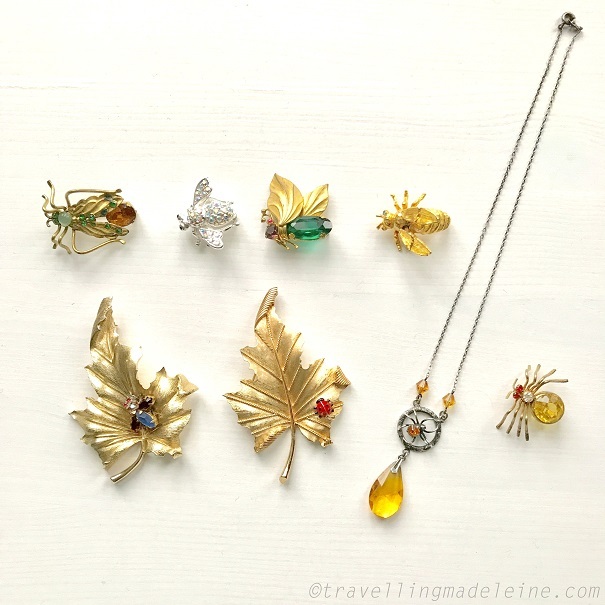 And various golden leaves earrings. 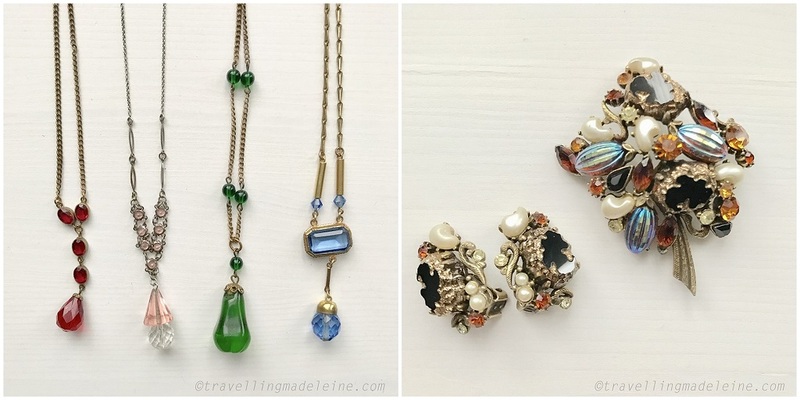 All earrings on the right are Trifari's. Volume 3 is "Rainbow Heart". So I collect jewellery of various women's hearts! All are different in colours and styles. Pick one to match your heart! I have more heart motifs, but I chose 7-8 colours of my favourites. 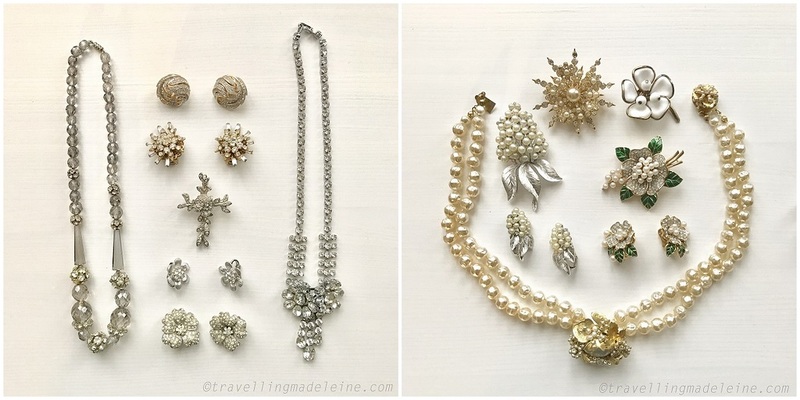 My best is a necklace on the top left, from the 1930's. So cute with blue heart shaped glass and pearls. And lucite earrings on the bottom left. I don't usually buy lucite reverse curved jewellery. Too classical and girly for me. However, I loved them so much with the heart shape! I will look for this kind of lucite jewellery. These jewellery are for online store. I will upload in this month..... I will..... I hope. lol. 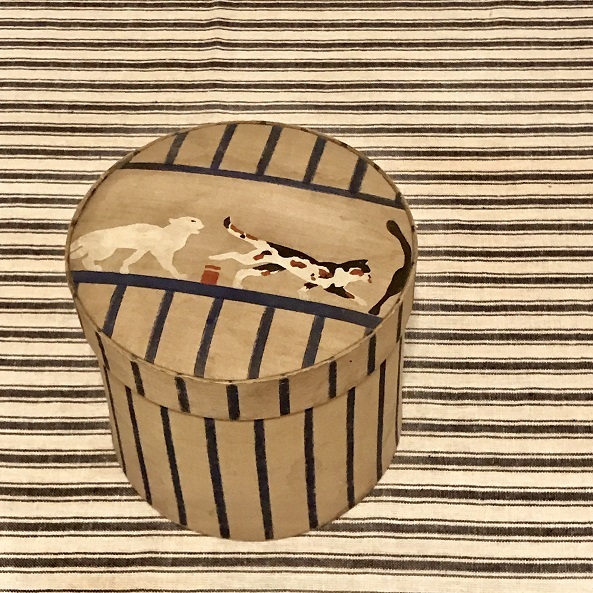 I actually have more new jewellery and interior item, but I will show them next month. Please wait until next month! 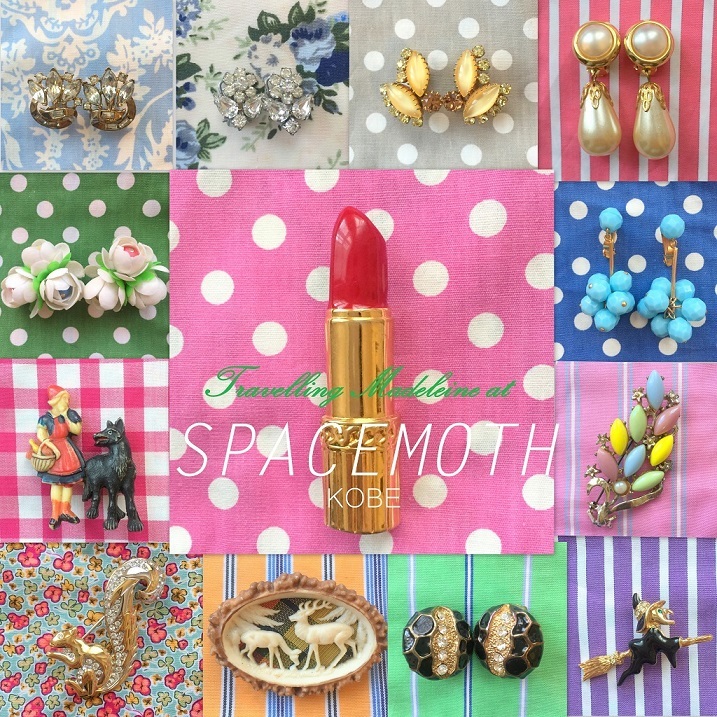 Travelling Madeleine is now available at a vintage shop in Kobe "Spacemoth". It is a lovely girly European & American vintage shop. I am very happy that my jewellery is available in the shop. I am a breast cancer survivor. I would love to let you know about Breast Cancer more and have a test for yourselves. #wearitpink is one of the campaign of breast cancer awareness. but at least I would love to let you know about #wearitpink and would like you to wear pink in this month. 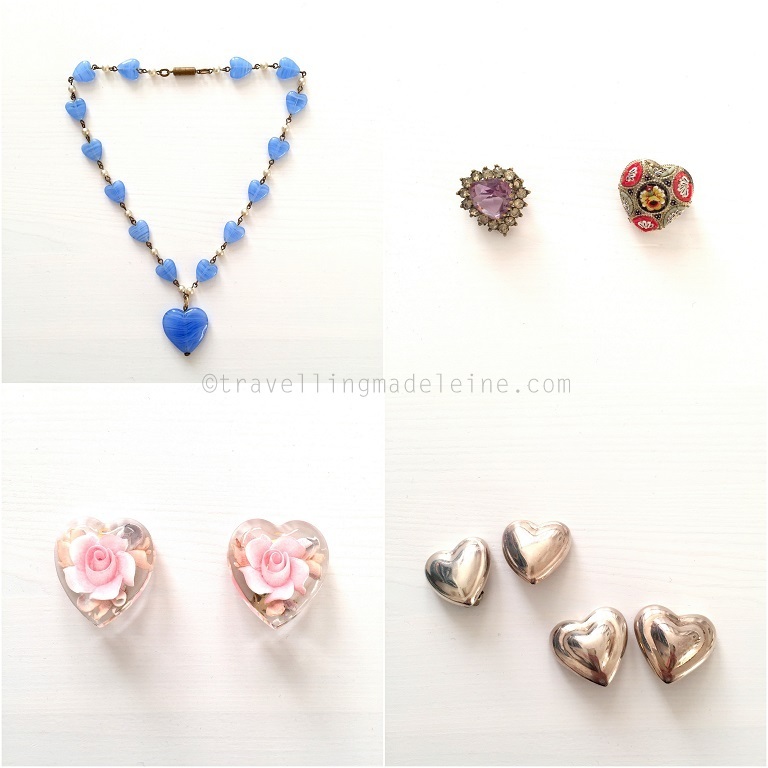 Please have a look our lovely pink vintage jewellery, but again, THIS IS NOT CHARITY. Our new items has arrived! I collected lovely funny animals. At Frock me! Vintage Fair in June. There were lots of fashionable people in the fair, but they stood out among them. They are, Yuiko(@ouicokd) who works at Lila in Osaka, which sells my vintage jewellery, and her friend Nene(@dollnene). Most of vintage fashion lover styled them in a perfect vintage style. But they wear vintage dresses just like modern pieces in current mode style. Hi everyone! I went to Malta last week! It was my 40th birthday!! The whole country of Malta celebrated my birthday! It seemed to be the 50th birthday of the church behind me. There were tons of confetti, so I took photo for my birthday celebration. Besides, I have encountered someone's happy birthday song, twice. Good start for the 40's. For my special 40th birthday holiday, I was thinking where to go.... So many places I want to go! But I am really in love with blue of the Mediterranean Sea. I didn't know anything about Malta, but it is really getting popular! Specially Blue Lagoon in Comino island. I wanted to go there too! 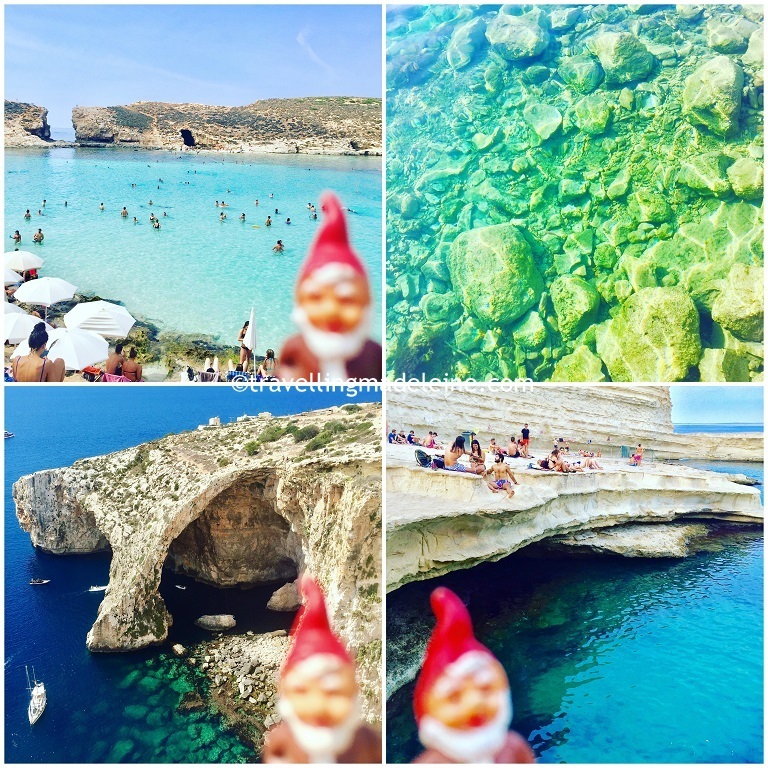 Most of sea around Malta is very clear, but Blue Lagoon was really special. 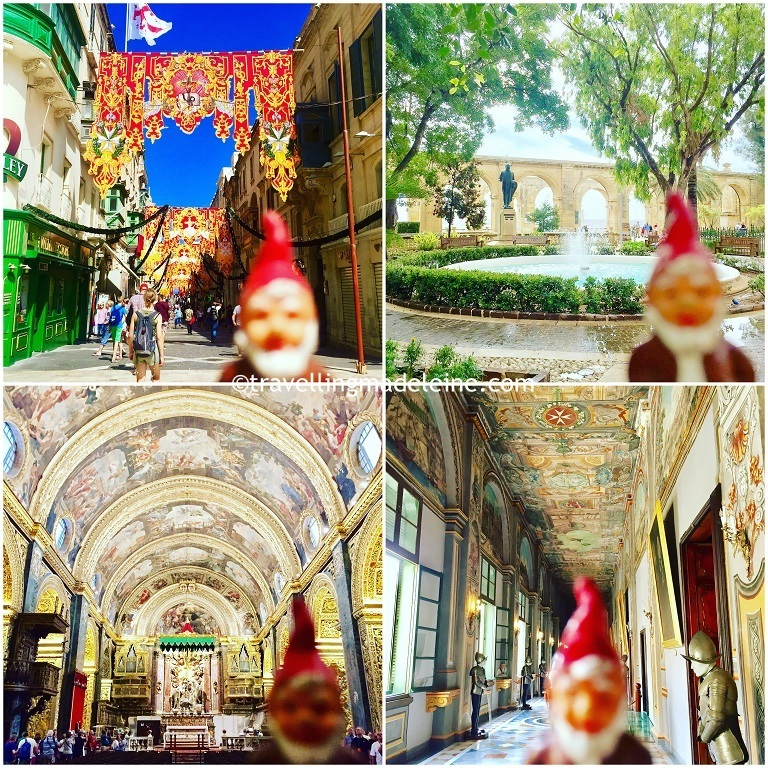 We stayed in Valletta, because I love old city. 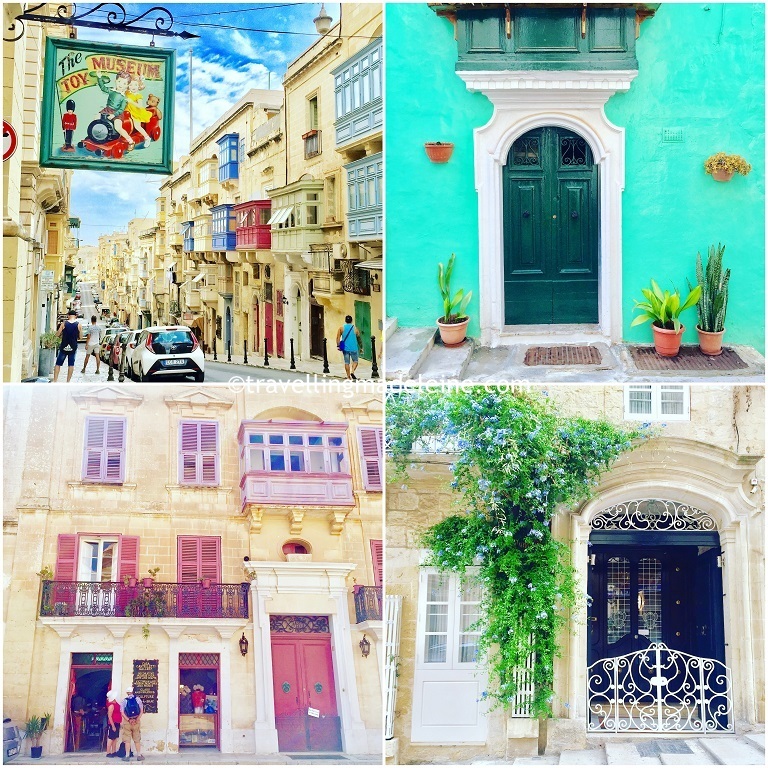 We stayed for a week, which I thought too enough to see Malta, but it was not at all! I haven't researched anything but blue lagoon, I should have researched more. Then we could have been more efficient. 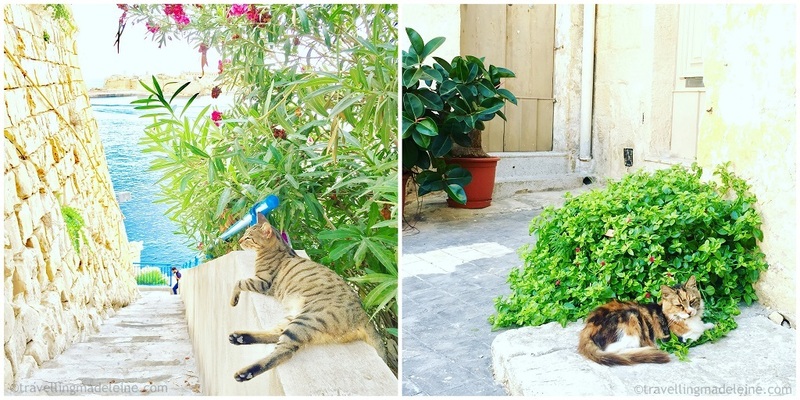 Malta is so colourful and cute. 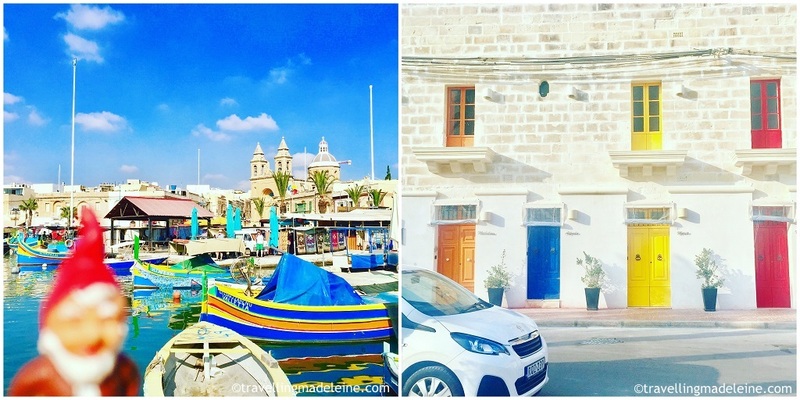 Marsaxlokk is a small village in South of Malta, where is very famous. But I didn't know that at all. I just went there because there is a market every Sunday. After we arrived, I heard that there is a very famous beautiful spot to swim. I should really have checked! However, we visited most of all famous spots and enjoyed a lot! I love visiting old churches. 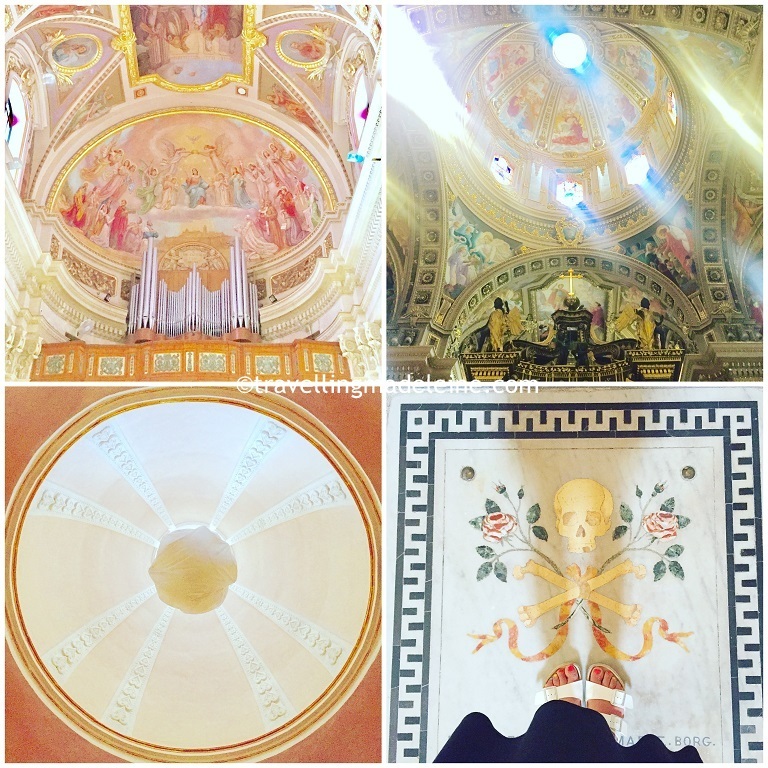 And churches in Malta are so beautiful. I found a very cute local church, but as soon as we entered, the mass began. I wanted to take photos, but I had to give up. 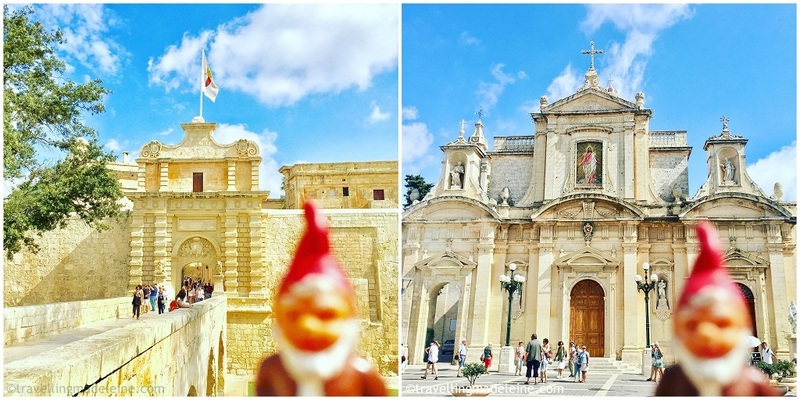 We really enjoyed Malta, our last summer in 2018! It was so hot and bright, but it's so cold here in London! How come I feel cold with a thick winter knit at home!? It's still September! We were really glad that we went there, our bodies became healthier. I really need to go to hot country for sunbathing at least once a year. I have got so many thing I want to write here. I will write this travel log while I still have this passion!